The Trekker is the perfect take anywhere writing instrument. In addition to the built-in keyring, a carabiner and a break-away lanyard are included, allowing you to attach the Trekker to a belt loop, backpack or wear it round your neck. The PR4 pressurised cartridge, designed for use by NASA’s astronauts, is filled with thixotropic, visco-elastic ink allowing the user to write in extreme temperatures (-30 to 250 degrees F), underwater and at any angle – even upside down. 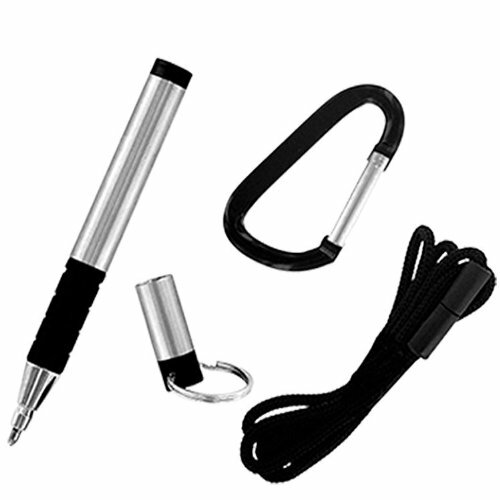 The Trekker also features Fisher’s rubber Comfort Grip for comfortable writing. The ‘Go anywhere, write everywhere pen’.The space pen for the great outdoors.